Illusionistic ceiling painting, which includes the techniques of perspective di sotto in sù and quadratura, is the tradition in Renaissance, Baroque and Rococo art in which trompe l'oeil, perspective tools such as foreshortening, and other spatial effects are used to create the illusion of three-dimensional space on an otherwise two-dimensional or mostly flat ceiling surface above the viewer. It is frequently used to create the illusion an open sky, such as with the oculus in Andrea Mantegna's Camera degli Sposi, or the illusion of an architectural space such as the cupola, one of Andrea Pozzo's frescoes in Sant'Ignazio, Rome. Illusionistic ceiling painting belongs to the general class of illusionism in art—art designed to create accurate representations of reality. Di sotto in sù (or sotto in su), which means "seen from below" or "from below, upward" in Italian, developed in late Quattrocento Italian Renaissance painting, notably in Andrea Mantegna's Camera degli Sposi in Mantua and in frescoes by Melozzo da Forlì. Italian terminology for this technique reflects the latter artist's influence and is called prospettiva melozziana, or "Melozzo's perspective". Another notable use is by Antonio da Correggio in the Duomo of Parma, which foreshadows Baroque grandeur. The technique often uses foreshortened figures and an architectural vanishing point to create the perception of true space on a painted, most-often frescoed, ceiling above the viewer. Quadratura may also employ other illusionistic painting techniques, such as anamorphosis. Andrea Pozzo at San Ignazio in Rome and the Jesuit church in Vienna. He wrote the standard theoretical work of his artistic ideas in the two volumes of : Perspectiva pictorum et architectorum Andreae Putei a societate Jesu (Rome, 1693–1700). Gianbattista Tiepolo in the Ca' Rezzonico in Venice, Villa Pisani at Stra, and the throne room at the Royal Palace of Madrid. Other examples were by Paolo Veronese at Villa Rotonda in Vicenza and Baldassare Peruzzi in the Villa Farnesina of Rome. 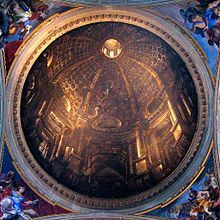 Italian Renaissance artists applied their confidence in handling perspective to projects for ceilings and overcame the problems of applying linear perspective to the concave surfaces of domes in order to dissolve the architecture and create illusions of limitless space. Painted and patterned ceilings were a Gothic tradition in Italy as elsewhere; but the first ceiling painted to feign open space, was created by Andrea Mantegna, a master of perspective who went to Mantua as court painter to the Gonzaga. His masterpiece was a series of frescoes that culminated in 1474 in the Camera degli Sposi (bridal chamber) of the Ducal Palace. In these works, he carried the art of illusionistic perspective to new limits. He frescoed the walls with illusionistic scenes of court life, while the ceiling appeared as if it were an oculus open to the sky, with servants, a peacock, and cherubs leaning over a balustrade, seen in strongly foreshortened perspective from below—di sotto in sù. This was the prototype of illusionistic ceiling painting that was to become an important element of Italian baroque. Correggio at Parma took the illusionistic ceiling a step farther in his frescoes of Christ and the Apostles for the cupola at the San Giovanni Evangelista and in the Assumption of the Virgin in the dome of the Cathedral of Parma, which is Correggio's most famous work (1520–24); in these frescos Correggio treats the entire surface as the vast and frameless vault of heaven in which the figures float. In a visual continuity between the architectural interior and its painted surfaces, Corregio's clouds and figures appear to inhabit the same architectural space in which the spectator stands. In Baroque Rome, the long-standing tradition of frescoed ceilings received a push from the grand projects in Palazzo Farnese under the guidance of Annibale Carracci and his team, but the figural subjects were still enclosed within multiple framed compartments (quadri riportati), and the perspective of subjects seen from below was not consistently taken into consideration. From 1625 to 1627 Giovanni Lanfranco, a native of Parma who knew Correggio's dome, painted the enormous dome of the church of Sant'Andrea della Valle with an Assumption of the Virgin that overwhelmed contemporary spectators with its exuberant illusionistic effects and became one of the first high baroque masterpieces. Lanfranco's work in Rome (1613–1630) and in Naples (1634–1646) was fundamental to the development of illusionism in Italy. Pietro Berrettini, called Pietro da Cortona, developed the illusionistic ceiling fresco to an extraordinary degree in works such as the ceiling (1633–1639) of the gran salone of Palazzo Barberini. From 1676 to 1679 Giovanni Battista Gaulli, called Baciccio, painted an Adoration of the Name of Jesus on the ceiling of the Church of the Gesù, the Jesuit headquarters in Rome. From 1691 to 1694 Andrea Pozzo painted the Entrance of Saint Ignatius into Paradise on the nave vault of Sant'Ignazio, Rome, with theatricality and emotion. ^ Rudolf Wittkower, Joseph Connors, and Jennifer Montagu, Art and Architecture in Italy, 1600–1750, vol. 1, Pelican history of art, New Haven: Yale University Press (1999): 35–36. I. Sjöström, Quadratura : studies in Italian ceiling painting, Stockholm, 1978. Quadratura : Geschichte, Theorie, Technik, ed. Pascal Dubourg Glatigny and Matthias Bleyl, Berlin, 2011. Trevor Hunt, "From Mantegna to Michelangelo: illusionistic ceiling paintings of the Renaissance pave the way for Baroque excess"